for above- or below-ambient applications. Personnel Protection for Horizontal Piping Calculator. pay for themselves in reduced energy costs. measures are simple, like return on investment (ROI) and simple payback period. variable. Sample inputs appear in a box, after each instruction. insulation project, or a small mechanical insulation investment. for instructionson on using the Energy Calculator for Horizontal Piping. annually over the life of the scope of work identified in Line 1.
useful life for the scope of work identified in Line 1.
risk, or a company-established minimum threshold. payback is calculated as the initial cost divided by the first-year savings. 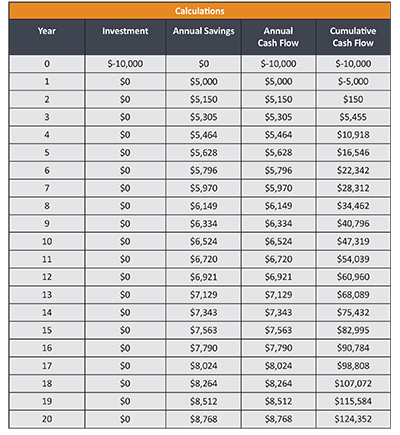 1, and annual savings occur at year-end. Savings after 20 years are ignored. 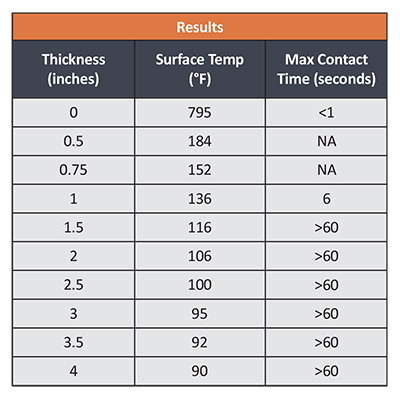 contact may be made with a heated surface. some are available in sizes and thicknesses not listed. can select any pipe size from ½” to 24″ from the drop down box. is 800°F. You should enter the actual operating or process temperature. emittance, please refer to the MIDG website. design considerations of mechanical insulation systems. determine the many benefits and value of mechanical insulation.